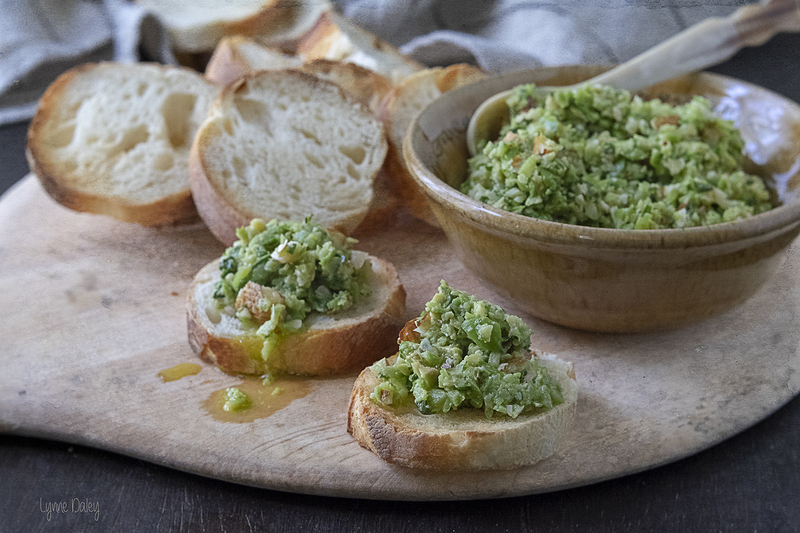 This bright green tapenade is made with the mild buttery Castelvetrano olive, the aromatic sweet basil, the piquant salty caper, and the crunch of chunky bits of almonds. Add minced garlic, lemon juice and olive oil and this will be an appetizer that comes together easily using a food processor. It’s great to know that the ingredients for the tapenade can be found easily in most supermarkets, too! If you are wondering what exactly is a tapenade? 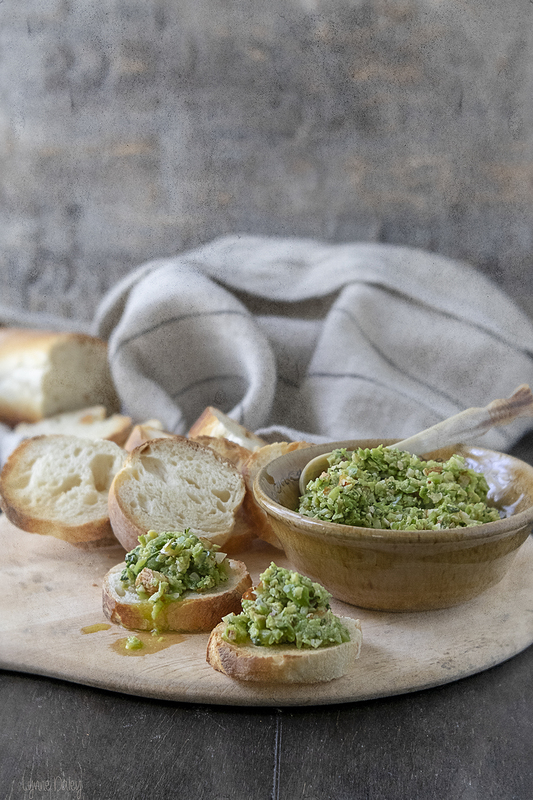 According to Clifford A Wright, the esteemed writer and winner of several James Beard awards, a tapenade is traditionally a seasoned Provencal condiment made with black olives, capers, and other aromatics. Tapenade comes from the Provencal word Tapeno, meaning capers. In essence, to be called an authentic tapenade, capers must be an integral component. Otherwise, it is an olive relish. Place the pitted olives, almonds, garlic, lemon juice and capers in the bowl of a food processor. Coarsely chop the basil leaves, add them to the machine and pulse a few times to begin breaking down the ingredients. Add the olive oil and sprinkle of salt, then pulse until the mixture comes together as a coarse paste. you want to be able to have some texture and crunch from the almonds. Store refrigerated in a covered container for up to a week. I have read that if a layer of olive oil is covering the tapenade, it will last somewhat longer. David Lebovitz is not only a professional chef, but a brilliant storyteller whose refreshing wit and excellent knowledge of his craft has been a great inspiration for me.This easy and delicious vegetarian appetizer from his book My Paris Kitchen will be a great edition to Menu Lib (e) ro hosted this session by Cinzia of CindyStarBlog. English here. Feast your eyes on her delicious Caramelized Garlic Tart! Building a menu starting from recipes taken from cookbooks, an idea from Marta and brought to fruition by Eloisa is a fun project and when completed, there will be many combinations of dishes to choose from.